Operational at 496 Toll Plazas Across India. National Highways Authority of India (NHAI) & Indian Highways Management Company Limited (IHMCL) have authorized NPCI for providing a composite solution on Electronic Toll Collection. 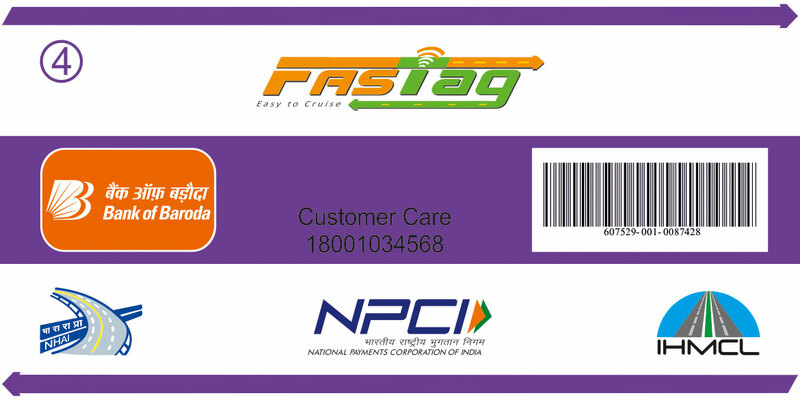 The Baroda FASTag is a simple & reusable tag based on Radio-Frequency IDentification Technology (RFID) that will be affixed on a vehicle’s windscreen. Each tag is linked to a prepaid account maintained at Bank end to facilitate instant automatic deduction of toll charges. Bank of Baroda issues prepaid RFID tags to customers which can be recharged. Once Tags are affixed on vehicle that vehicle can pass through ETC (Electronic Toll Collection) lane at Toll Plazas without stopping and Toll charges will be automatically deducted from the account linked to Tag. The customer will save time and will not have to stop at Toll Plazas for Toll payment which will reduce congestion. Near non-stop motion & reduced commute time. Online recharge available through card, Internet Banking & UPI. For any queries, or support please call our Contact Center.